Humiditreat Scale Reducing Inline Filter for Whole House Humidifiers. Humidi-Treat is designed for humidifiers using up to 25 gallons per day, and will inhibit scale for one season. 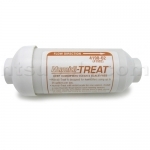 Install Humidi-Treat on the water line that supplies water directly to the humidifier. Clean pad or install new pad before installing Humidi-Treat. For best results humidifier should have a daily dump of water from the sump to diminish . scale forming minerals. Install a new Humidi-Treat before each heating season. Humidi-Treat works best when installed on a cold water line. * Insure proper direction of water flow and connect inlet and outlet.